TAKE A PLUNGE & JOIN DIVE TEAM! Check back for hours of operations, daily and special event menus. Off-season updates are being made to the construction started last year and will be reported here. There is a $50 non-refundable fee to apply for Equity Membership, Full Summer Affiliate, or Late Summer Affiliate swim privileges. Each category has limits: 300 Equity Members, 275 Full Summer Affiliates, and 80 Late Summer Affiliates. Current Equity Members are guaranteed swim privileges each season. Anyone may apply for Equity Membership. When slots are available, priority is given to those who live within the pool boundaries. Current Full Summer Affiliates receive the option to renew swim privileges. Contact MerrimackPool@gmail.com with questions. 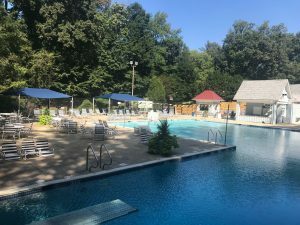 A member-owned and -operated community pool in the Bannockburn neighborhood of Bethesda, Maryland, Merrimack has been offering members fun in the sun and cool in the pool for over 50 years. We are located at the end of a quiet street surrounded by trees on a spacious property that includes a grassy play area with picnic tables and ample parking. The heated outdoor pool is open each season from mid-May until mid-September. We have a 7-lane competition pool and a large diving well with dual 1-meter boards. We also offer a wonderful kiddie pool area with a graduated beach entry, bubblers, and a “lemon drop” fountain sprayer. A 3-foot deep transition pool area is perfect for kids just learning to swim. In 2018, the property was fully renovated to include a new entry check-in gatehouse, updated and remodeled women’s and men’s bathhouse locker rooms, and the addition of Mack’s Cafe offering patio deck table seating. Mack’s Cafe has a wide variety of lunch, dinner, and snack food options. Ping pong and foosball tables are also available on the patio deck. Merrimack is part of the Mongtomery County Swim League (MCSL) and the Montgomery County Diving League (MCDL) and its teams, the Maniacs, offer summer team practice programs from May to July. Swimmers participate in competitive swim and dive meets against other county pools in June and July. Swimming and diving lessons are available to members from our lifeguards and swim and dive team coaches. Early bird swim is available during weekday mornings from June into August. Merrimack provides a friendly social environment where members can enjoy summer comradery and fun, especially during social events and holiday parties. There are plenty of opportunities to volunteer at this community pool to meet neighbors and to support the pool activities.